We want to help! Now you can improve the security and income level of your hypnosis practice! Work successfully with more clients. 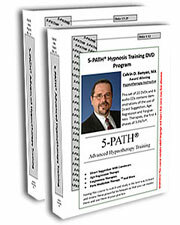 Get the NEW 5-PATH® 2.0 – Hypnosis Training DVD Set Sold every day at $949.00 now available at $649.00! You save: $300.00 off during the "Economic Stimulus Package" special. Sale will end without notice. If you ask any 5-PATHer the best way to do that is to study the universal approach to doing hypnosis called 5-PATH®. Master this 5-phased process and you can become a Hypno-1%er™, the best of the best in the profession. And for now, you can actually SAVE $300.00! How’s that? Save money, and enable yourself to make more money in your hypnotherapy practice. That is what I call "WIN-WIN"! More than 2 Times the Information of the Original! This is the Banyan Hypnosis and Hypnotherapy Super Course! How to take your clients into deep hypnosis (somnambulism) quickly. How to supercharge direct suggestion by using insight therapy. How to create powerful change by doing Forgiveness Therapy. How to end internal conflict and secondary gain with Parts Mediation Therapy. Since the Center was opened we have performed over 32,000 individual one-on-one hypnosis sessions. Out of this experience came a process that we call 5-PATH®. Now you can gain for that extensive experience like so many around the world have, AND save $300.00 during this "Economic Stimulus Package". This opportunity will end without notice. Click Here now to Get ALL THE DETAILS and get your 5-PATH® 2.0 set during this exciting sale! I really enjoyed the DVD training on the old 5-Path set. I just don’t have the confidence to use the system and would like the new version. So far business in my area is so bad that I just can’t do it this year. Perhaps next year. Kent. Hi Kent – Thanks for the message. Thanks for your kind comments about the old set. I think that when you get the new set you will be blown away with how much more improved it is. Give our office a call and we’ll see if we can work out something for you so that you can get the set. 800-965-3390 will work fine. Sorry to say that the “Economic Stimulus Package” very special sale is over. We run specials on different training programs at different times of the year, and they cannot last long. Fortunately, right now it is on special for $200.00 off. We have no plans of ever running that “Economic Stimulus Package” discount price again. The current special of $200 off will also end making room for our next special. If you have questions please give us a call at 800-965-3390. I recommend that everyone become a VIP member so that you can receive our newsletter and be notified when we have any future specials.